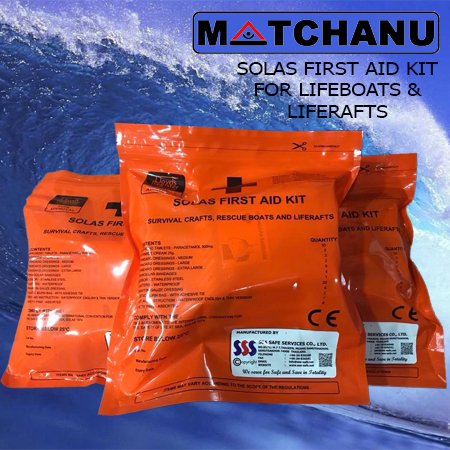 SOLAS FIRST AID KIT FOR SURVIVAL CRAFTS AND RESCUE BOATS PRODUCT SPECIFICATION: SOLAS FIRST AID KITS The SOLAS First Aid Kit produced under SEA SAFE SERVICES CO., LTD provides the necessary medical equipment for lifeboats (LB), life rafts (LR), rescue boats (RB) and combined life/rescue boats (LR/RB) fitted on board of NON EU and EU vessels. The SOLAS First Aid Kit shall meet the requirement under the ISO standards 18813:2006 and MCA MSN 1768 (M+F). 1. PRODUCT DESIGN 1.1 Product detail and specification: External content 1.1.1 SOLAS first aid kits are packed in suitable waterproof and re-sealable bag with a size of 6”x12” or 150 mm x 300 mm 1.1.2 The waterproof bag has a background color of bright orange with a recognizable medical aid symbol and re-sealable cap for the purpose of multiple usages. 1.1.3 The storage detail and expiration date are clearly present in front of the bag 1.1.4 Medical contents are shown in front of the bag, including the number/quantity of contents present in the kit 1.1.5 The manufacturer title, address, and logo are present in front of the bag 1.1.6 Lloyd’s Registered Approval Mark is present in front of the bag 1.2 Product detail and specification: Internal content 1.2.1 All medical supplied contents are packed corresponding to Lloyd’s Registered Certification 1.2.2 First Aid instructions: 1.2.2.1 The instructions are written clearly in English and Thai languages 1.2.2.2 The instructions contain the brief description, method of use, drug side effects, drug contraindications of each medical supplies 1.2.3 Medicines (All medicines are present in their generic names): 1.2.3.1 Analgesic medications: group of drugs used to relieve pain and fever 1.2.3.1.1 Paracetamol (Acetaminophen) Dose: 500 mg Provided quantity: 50 tablets1.2.3.2 Antiseptic preparations: group of drugs that are applied externally to skin to reduce the possibility of infection, sepsis or putrefaction. 1.2.3.2.1 Cetrimide cream Dose: 0.5% w/w Provided quantity: 2 tube (25g per each) 1.2.3.3 Triangular Bandage Provided quantity: 41.2.3.4 Standard dressing Size: medium, large and extra large Provided quantity: 8 (Medium : 2 pcs., Large : 2 pcs., Extra Large : 6 pcs. )1.2.3.5 Standard paraffin Gauze dressing Size: 10 cm x 10 cm Provided quantity: 6 1.2.3.6 Sterile adhesive plaster (waterproof) Size: assorted size Provided quantity: 201.2.3.7 Polythene bag with adhesive tie (for hand/foot burns) Provided quantity: 21.2.3.8 Safety Pins Size: assorted sizes Provided quantity: 61.2.3.9 Stainless Steel Scissors Provided quantity: 1 unit.2. PRODUCT TESTING 2.1 Inspection and testing 2.1.1 SEA SAFE SERVICES CO., LTD, as the producer of SOLAS first aid kit, ensure that the selected sample for the inspection can be representative of the entire range of products and that the selected sample for the inspection will be produced using the same methods and tools established for the production run. 2.1.2 SEA SAFE SERVICES CO., LTD, as the producer of SOLAS first aid kit, shall agree with Lloyd’s Registered that the sample product will be selected at random and where possible, should cover a series of production batches. 2.1.3 SEA SAFE SERVICES CO., LTD, as the producer of SOLAS first aid kit, shall assure that the sample must be positively identified so as to indicate any tampering. Samples that have been tampered with shall be replaced and the tests repeated. 2.1.4 SEA SAFE SERVICES CO., LTD, as the producer of SOLAS first aid kit, shall ensure that the place of manufacturer will be inspected by a Lloyd’s Registered representative to establish the existence of Quality Assurance controls and ensure conformity of the product throughout the life of the Type of Approval Certificate, nominally for five years as state to Annex C for “Inspection and Surveillance of Production Facilities”. 2.2 Testing: Performance and environmental tests 2.2.1 Type of testing: Drop test 2.2.2 The test shall be carried from a height of at least 36 meters with satisfactory results under the supervision of a Lloyd’s Register representative. 2.2.3 The test shall be carried out on representative samples to confirm that the performance provision of the specified standard(s) are fulfilled. 2.2.4 The test shall be conducted at a facility acceptable to Lloyd’s registered, where the tests are witnessed by a Lloyd’s Register representative. 2.2.5 All the tests and measuring equipment shall have proven accuracy and be calibrated and certified to a national secondary standard of measurement. 2.2.6 SEA SAFE SERVICES CO., LTD., as the producer of SOLAS first aid kit, shall ensure that the test methods will be consistent with the purpose of the specific standard(s). 2.2.7 SEA SAFE SERVICES CO., LTD., as the producer of SOLAS first aid kit, shall ensure that a test report will be issued, identified by number and date which accurately, clearly, and unambiguous presents and that the English language shall be used. 3. PRODUCT RESPONSIBILITY 3.1 SEA SAFE SERVICES CO., LTD., as the producer of SOLAS first aid kit, ensure that each SOLAS first aid kit and each medical item supplied in the kit is in strict conformity with the corresponding Lloyd’s Register Certificate: 3.1.1 Each SOLAS first aid kit is provided with adequate transit protection and packing to maintain conformity with the Lloyd’s Register Certification. 3.1.2 Each SOLAS first aid kit is provided with appropriate instructions and warnings with respect to its handling. 3.2 SEA SAFE SERVICES CO., LTD., as the producer of SOLAS first aid kit, shall make reference to Lloyd’s Register Type Approval, the Lloyd’s Register Type Approval Mark, or Lloyd’s Register’s name in advertising or otherwise, for SOLAS first aid kit that have been certified by Lloyd’s Register. 3.3 SEA SAFE SERVICES CO., LTD., as the producer of SOLAS first aid kit, shall not mislead purchasers by claiming performance not covered by the certification. 3.4 SEA SAFE SERVICES CO., LTD., as the producer of SOLAS first aid kit, shall maintain a record of all complaints and any remedial action relative to each SOLAS first aid kit certified. Such records will be available for Lloyd’s Register’s review upon request. Copyright © 2011 Matchanu Marine (Thailand) All rights reserved.